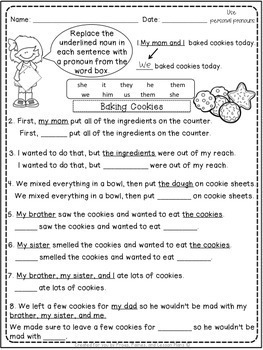 This product consists of 12 practice worksheets, a Literacy Center, and Editable Templates. 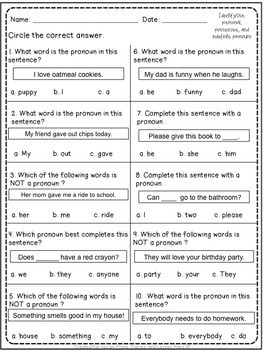 All activities target the Common Core standards for Pronouns in First Grade. 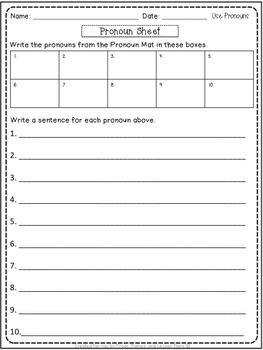 Each practice sheet clearly targets a standard, and uses different methods such as: cut and paste, fill in the blanks, multiple choice, color, and write sentences. Because of the variety of sheets, you can use them when you review these standards many times throughout the year. ✔ Available in a complete Parts of Speech bundle! Select the sheet that fits the ability level of your students as you spiral the curriculum. 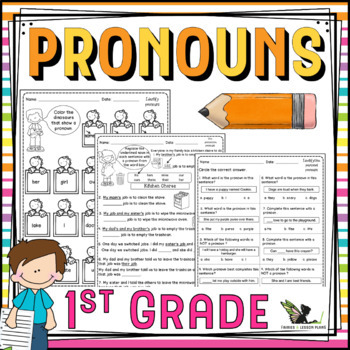 The Literacy Center includes a Pronoun Mat where students place cards that have pronouns, 4 different sets of sorting cards, and a Pronouns Sheet where they write the sorted pronouns and write sentences with them. There's more! Included in this packet is an editable PowerPoint file that allows you to create other cut and paste activities, multiple choice assessments, and new sorting cards for the Literacy Center. This packet is also available in bigger discount bundles.